If you give out 100 promotion cards for $10 and one person finds salvation and will be in heaven, would it be worth your money and effort? What if one Christian becomes much more like Jesus and he or she glorifies God 5% more for now and all eternity? Would that be worth your money and effort? 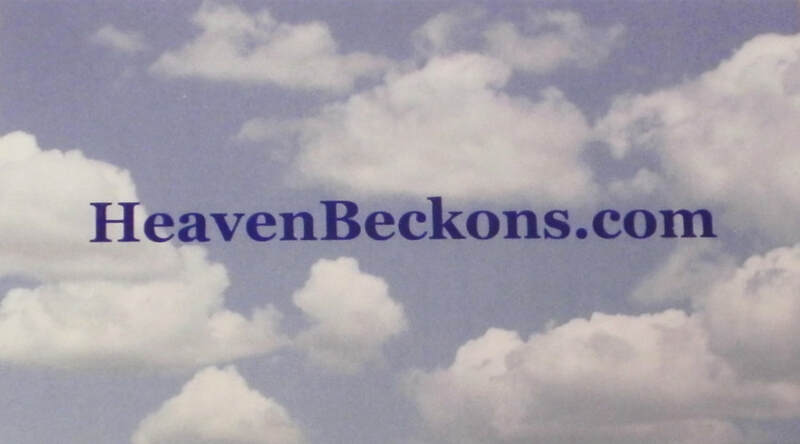 Promotion cards are the primary way of our getting the word out about HeavenBeckons.com. If you partner with us, this is one way you can help spread the word. Just purchase some and pass them around. These are really nice to give out. There is nothing on the back. Give them out to anyone without feeling that you are selling anything or pushing anything on anyone. Most people are interested in heaven, whether or not they are Christians. Also, Promotion Cards are ideal to give anyone with serious illness - and much more critical than flowers (although attaching one to a bouquet would be a "nice touch". Promotion cards are heavy-weight, really nice business cards. They are 10 cents each. Shipping and handling costs are included in the price, not added separately. We ship only to addresses within the United States of America at this time. Email us if you are in another country and we will determine the cost to send you Promotion Cards. Click on the number you want to order. If there is profit after shipping and handling, it goes into other advertising. We NEVER give away your email address to anyone. Nor do we use it to bother you with emails. We don't want to. And, we do not have the time.